... Grandmaster Vugar Gashimov. The tournament take place in Shamkir, Azerbaijan. A lot of strong players are participating, including the World Chess Champion, Magnus Carlsen. 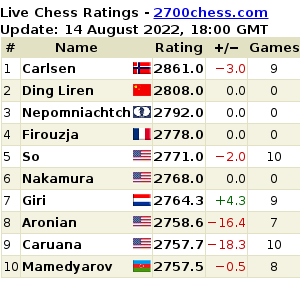 However, Magnus isn't the only strong player as Ding Liren, Anish Giri, Shakhriyar Mamedyarov, Viswanathan Anand, Alexander Grishuk, Teimour Radjabov, Sergey Karjakin, Vaselin Topalov and David Navara can guarantee to us that we'll going to see a very fighting tournament and games. Even from the first round the games was very fighting and especially Anand - Navara. The Indian super star and former World Chess Champion had David on the ropes as you can see in the following diagram. Animal action my like a bully. As you can see White have three pawns up and you may imagine that it's a very easily winning position, however, Anand's last move was a terribly mistake that allowed Black to escape with the perpetual check. Can you find the forcing continuation? It is Black turn. Teimour Radjabov played very solidly and he didn't give any real chance to Magnus Carlsen fighting for more than a draw. The price Fund is 100,000 euros or $112,266 if you prefer. The first player will take only the 30,000 euros, or $33,678. As I mentioned earlier the tournament started in Sunday 31 of March and it will end April 9. Please remember not to open your TV on April 5, because this is a test day. However, you might consider to visit my website Rules-Chess-Strategies because we are trying to updated often. Another interesting point is that Magnus had already won three of these tournaments, on 2014, 2015 and 2018. However, when Magnus didn't play on that tournament Mamedyarov was the solid leader on 2016 and 2017. In the light of that it's a very interesting to see who will be the winner this year; Carlsen or Mamedyarov, what do you think?